An unnamed Israeli official had earlier floated a story that Prime Minister Benjamin Netanyahu did some tough talking with Lavrov and “rebuffed” a Russian offer to create a 100-kilometre buffer zone adjacent to Golan Heights. Netanyahu reportedly insisted that he won’t be satisfied with anything short of Iran ending its presence in Syria conclusively. 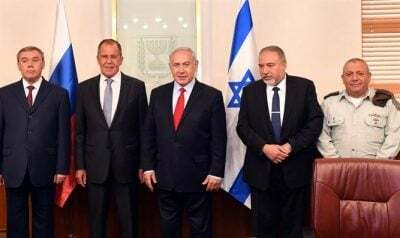 The TASS report on July 25 punctures the Israeli version that the two Russian officials were deputed by President Vladimir Putin specially to discuss with Netanyahu the future of Iranian presence in Syria. (It now transpires that the Russian officials were on a tour of Israel, Germany and France.) The Israeli bravado can only be seen as a desperate ploy to cover up its humiliating defeat in Syria with the terrorist groups that were its proxies surrendering lock, stock and barrel in Daraa and Quneitra to the Syrian-Russian forces – especially the hasty exfiltration of the controversial group known as the White Helmets to Jordan via Golan Heights with the logistical help from the Israeli military. Nonetheless, the Israeli propaganda has gone overboard in attempting to create a wedge between Russia and Iran. (Read a fine piece, here, by Moon of Alabama on the Israeli disinformation campaign.) This couldn’t have gone down well in Moscow. At any rate, Russian Foreign Ministry came out on July 24 with some sharp criticism of the move by the Israeli parliament (six days earlier) to adopt a bill known as Basic Law: Israel as the Nation-State of the Jewish People. The operation by the Syrian forces (backed by Russian allies) to liberate Quneitra succeeded beyond expectations once Washington signaled that the extremist groups entrenched in the southern provinces bordering Jordan and Israel should not expect any American intervention to bail them out. Damascus is now turning attention to the liberation of the northwestern province of Idlib. It will be a major confrontation due to the presence of a large number of foreign terrorists in Northwestern Syria. The Iranian media reported that a Russian flag ship Ro-Ro Sparta was spotted crossing the Bosporus en route to Syria’s Tartus, carrying military cargo mostly ammunition, shells and missiles and that the reinforcements are meant for the Syrian Army’s “upcoming assault” on Idlib province. M. K. Bhadrakumar is a career diplomat in the Indian Foreign Service for over 29 years, who served as India’s Ambassador to Uzbekistan (1995-1998) and Turkey (1998-2001).